Embattled Metro Nashville Public Schools Director Dr. Shawn Joseph says he has no plans on resigning "at this time" following his State of Schools address on Wednesday. 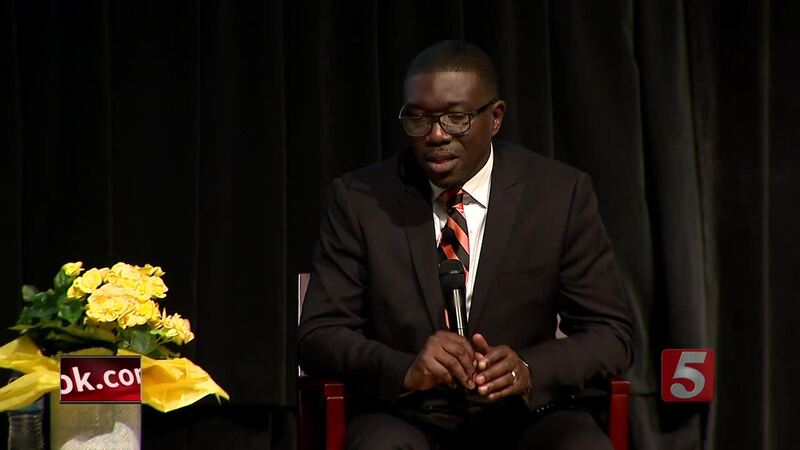 NASHVILLE, Tenn. (WTVF) — Hoping to reassure teachers and staff throughout Nashville that he is on their side, Dr. Shawn Joseph addressed the Metro Nashville Public School district on Wednesday during his annual State of the School's address. Dr. Joseph is working to quiet of myriad of concerns raised by teachers and staff over the last few months. Many teachers have come forward to NewsChannel 5 Investigates complaining of pay discrimination, wide-spread harassment by students and an overall morale "crisis," that is costing the district some of their most dedicated and highest performing teachers. In what seemed to be an effort to defuse the current situation in the district, Dr. Joseph appeared on stage with Hillsboro High School senior Kennedy Musgrave. Musgrave asked Dr. Joseph a series of questions written by the district, about everything from the budget to funding for text books. "I will say this, this budget doesn't go as far as I would it to go," Dr. Joseph told the audience at Stratford High School. Dr. Joseph also told reporters after the talk was over that he has no plans on resigning, "at this time." The State of the School's address comes just two weeks after Metro Nashville Public Schools outlined a comprehensive budget on that would include raises for all teachers while cutting at least 11 staff members. But many teachers have said the raise is a "joke," calling on the district to fight for an 18 percent raise to cover cost of living expenses in one of the nation's fastest growing cities. Because of budget cuts last year, MNPS employees including teachers, did not get a raise. "Many people are saying this is not enough because last year we couldn't give any raises... we have to pay a livable wage if we want to keep quality talent," the Superintendent added. The proposed $918 million budget would be a 3.6 percent increase over last year's budget when the district was forced to cut millions of dollars because of a drop in enrollment lead which lead to a reduction in state funds. On Tuesday MNPS Chief Operating Officer Chris Henson said the district wanted to give every staff member, in every position, a 3 percent cost-of-living raise. Those raises though would be contingent on the Metro Council and Mayor David Briley signing off on the additional $31.7 million the district is requesting this year. While staff may be getting a raise under the proposed budget, there are also at least 11 people who will lose their jobs under the plan. The proposed $918 million dollar budget would also allocate a $1 per-hour raise for all bus drivers and monitors. District officials said that raise is in response to a shortage of drivers across the city. If approved, the $2.12 million for bus drivers and monitors would also allow the district to implement an attendance bonus for drivers. During the hour long State of the Schools address, Dr. Joseph also said the district is planning on investing in the Human Resources Department to help retain and hire quality staff.